"statistics show ... .. Department of Corrections is still spending less money than it was five years ago, and is treating virtually nobody"
Attorneys for the National Lawyers Guild and Prisoners' Legal Services filed suit in U.S. District Court in Boston on behalf of two prisoners with hepatitis C - Emilian Paszko and Jeffrey Fowler - and an unknown number of other prisoners with the illness. They argue that the state has been reducing the number of patients treated for hepatitis C and has delayed evaluating patients in order to avoid being responsible for treating them. The lawsuit comes as new and more effective medications for hepatitis C have become available. But those medications are also expensive. Joel Thompson, a staff attorney for Prisoners' Legal Services, who filed the suit, said prisoners have been coming to the organization for decades looking for help getting hepatitis C treatment. According to the lawsuit, the procedure since 2002 has been that the Department of Corrections would determine how many inmates needed treatment and would maintain a waiting list for a limited number of treatment slots. When triple therapy became available, the lawsuit says, it took two years, from 2011 to 2013, for corrections officials to establish a treatment protocol and begin using it to treat patients. Today, the Department of Corrections treats hepatitis C using Sovaldi, Viekira Pak and Harvoni - new medications approved by the FDA in 2013 and 2014. The lawsuit alleges that the department reduced the number of patients on the old medications but has not stepped up treatment with the new medications. It says corrections officials are not doing the medical testing necessary to determine which patients with hepatitis C would benefit from treatment. According to Department of Corrections statistics, obtained by Prisoners' Legal Services, there were 11 patients on hepatitis C medications in July 2014, and that number dropped to just two patients in January 2015. Between July and February, the state spent $286,000 on hepatitis C medications, or an average of $35,000 a month, even though fewer than a dozen patients were being treated at any one time. Thompson said the statistics show that although the new medications are expensive, the Department of Corrections is still spending less money than it was five years ago, and is treating virtually nobody. State documents show that around 1,500 state prisoners have hepatitis C, although not all of them are in a stage where they need treatment. "This is at a time when we feel like they really need to ramp up the testing and triage of the patient population and ramp up the treatment," Thompson said. Jonathan Shapiro, a partner with Shapiro Weissberg & Garin who is handling the case pro bono for the National Lawyers Guild, which handles human rights and civil rights cases, said it is shortsighted to avoid treating hepatitis C due to the cost. "If he's not properly treated, in years to come, he's likely to require a liver transplant, which would be much more expensive," Shapiro said. Shapiro said the Department of Corrections has been "dragging its feet" for too long. "They claim that people will be treated, but they're just not doing it," he said. Thompson said the Department of Corrections knew the more effective medications were coming and could have budgeted accordingly - negotiating with its medical provider or asking the administration and the Legislature for more money. This issue is not unique to Massachusetts. Prisoners in Minnesota recently sued that state's Department of Corrections for failing to provide access to hepatitis C drugs. It is also not only an issue in prisons. The Boston Globe reported that MassHealth, the state's Medicaid program, is also facing enormous costs to cover hepatitis C medication. "Over 1,500 state prisoners in Massachusetts have Hepatitis C, but as of the present time only three are being treated for it. For many of them, including plaintiffs and the members of their class, the illness may progress toward end stage liver disease and death. A major advance in treatment was made in 2014, with the introduction of medication regimens that have near - perfect success rates, far fewer side effects, and a much shorter duration. Despite these advances, defendants have failed and refused to provide this new treatment to plaintiffs and the members of their class. The DOC and MPCH have instead continued a years - long reduction in the number of patients treated for Hepatitis C; they have knowingly delayed evaluating prisoners, and they have consciously avoided knowledge of their treatment needs. Prisoners who ought to receive the new medications are not receiving them, and a vast number of prisoners with Hepatitis C are not being afforded the necessary testing to determine whether they too should receive treatment. Plaintiffs Emilian Paszko and Jeffrey Fowler are two such prisoners. They bring this action on behalf of themselves and all other state prisoners with Hepatitis C to remedy defendants' deliberate indifference to their serious medical need for treatment for their Hepatitis C. By not assuming the financial cost of Hepatitis C treatment, defendants are imposing a human cost on the prisoners in their care as well as on the population which will be at risk when these prisoners are released." The claims concern defendants' protocol and practice for treating Hepatitis C, which is applicable to all prisoners with Hepatitis C. Common questions include (1) whether treatment for Hepatitis C is a serious medical need; (2) whether defendants have been deliberately indifferent to the serious medical needs of plaintiffs and the members of their class; (3) whether defendants have failed and refused to provide the necessary staging of Hepatitis C patients in accordance with the prevailing standard of care, including the pretreatment testing and specialist consults that are needed to determine the severity of the disease and the need for treatment; (4) whether defendants have failed and refused to provide treatment for plaintiffs and the members of their class with the newest, most effective medications for Hepatitis C in accordance with the prevailing standard of care; and (5) whether defendants' failure to provide treatment to plaintiffs and the member of their class in accordance with the prevailing standard of care for treatment of Hepatitis C has put plaintiffs and the members of their class at risk of serious harm." Two prisoners have sued the Massachusetts Department of Corrections to get access to the latest hepatitis treatments. 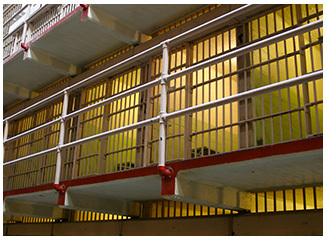 The two inmates, Emilian Paszko and Jeffrey Fowler, argue that the prison system has been withholding treatment from the estimated 1,500 patients in the Massachusetts state prison system who have hepatitis C.
The system has "continued a years-long reduction in the number of patients treated for hepatitis C," contends the lawsuit, filed on Paszko and Fowler's behalf by Prisoners' Legal Service, a non-profit advocacy group, and the National Lawyers Guild. "They have knowingly delayed evaluating prisoners, and they have consciously avoided knowledge of their treatment needs," the suit contends. "Prisoners who ought to receive the new medications are not receiving them, and a vast number of prisoners with hepatitis C are not being afforded the necessary testing to determine whether they too should receive treatment." The Massachusetts Department of Corrections declined comment today, due to the pending litigation. The plaintiff prisoners claim that only three prisoners in the entire system were being administered hepatitis C treatments. Drugs and therapies for the disease improved markedly in the last two years, especially with the appearance of new antivirals and the FDA's approval of the drugs Sovaldi and Olysio. The prisoners are seeking a court injunction forcing the Massachusetts prisons to administer the full range of available treatments to the hepatitis-positive inmates. "The DOC and its health care contractor knew before 2011, when triple therapy arrived, that they needed to bring a large number of prisoners who were previously ineligible for treatments - particularly non-responders and relapsers - back into the treatment protocol, but ordering pre-treatment tests and staging them," the lawsuit argues. "They failed to do so then, and defendants are failing to do so now." The Wall Street Journal reports that many prison systems in the U.S. prioritize expensive medical treatments to the most serious cases of disease among prisoners, due to budget constraints. Similar prisoner lawsuits have sprung up around the country, according to the National Hepatitis Corrections Network, an advocacy group. Hepatitis C was called a "silent epidemic" by the U.S. Surgeon General as early as 2000. Estimates place as much as 2 percent of the entire adult population of the country as carrying the virus. The latest estimates place 3.2 million cases of the disease in the U.S., with 17,000 new cases reported annually. The nation's prisoners have a higher percentage of the virus, due to intravenous drug use and other risk behaviors - some estimates place the prison population at 40 percent of the inmates being infected, according to the new lawsuit. "Defendants are imposing a human cost on the prisoners in their care as well as on the population which will be at risk when these prisoners are released," the lawsuit said.